It might have been hard to see the light at the end of the tunnel as Clemson pulled away from Notre Dame back on December 29th. The offense sputtered. The defense gave up big plays and 30 points in a game for the first time all season. The asterisk beside the defensive performance has been placed there because of the loss of All-American corner Julian Love. 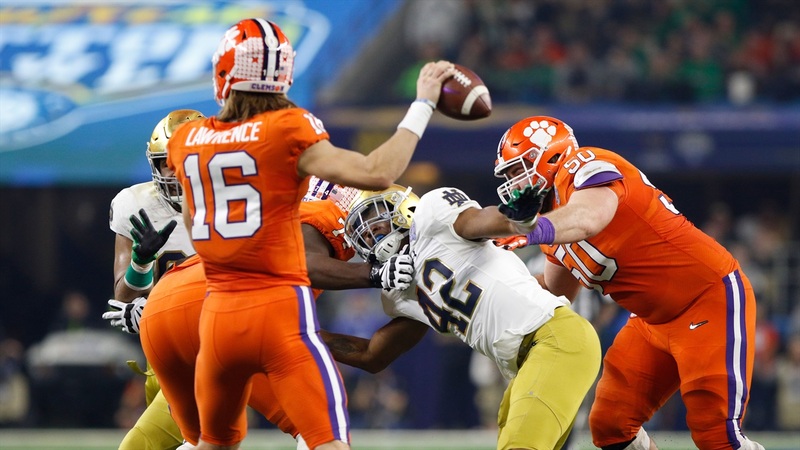 When he was in the game, the Irish shut down Trevor Lawrence and the Clemson passing attack. When Love was out of the game, well, you know what happened. Something that hasn’t been discussed enough was that Notre Dame lost Julian Okwara to an injury in the second quarter as well. He came back briefly for two plays, but was not a regular in the defense the rest of the night. Up until the point he left the game Okwara was ballin’. His stat line had him down for one tackle and one sack. That doesn’t come close to putting into context the impact he had getting after the passer..
Clark Lea and his defensive staff unleashed him as an interior pass rusher on 3rd downs. It was a brilliant move and after seeing how it worked prior to Okwara’s injury, it’s definitely something I would expect to see from the defense 2019. Notre Dame came out in a Bear front on the first 3rd down of the game for Clemson. A Bear front is when all three of the interior offensive linemen are covered. The Irish had Jerry Tillery (99) playing the nose with both Okwara (42) and Khalid Kareem (53) lined up as 3-techniques outside shade of the guard. If Lawrence doesn’t get rid of the ball here quickly, he’s about to get lit up by Tillery coming around on a stunt with Okwara crashing down into the center and pulling right guard Gage Cervenka (59) with him. Later on when faced with a key 3rd down in Notre Dame territory after the Ian Book fumble, Lea went back to the Bear front had another stunt called. This time it involved Tillery and Okwara slanting to their right and Kareem looping free around them. Not only was Kareem coming through unblocked, but Okwara was so violent slanting inside that he destroyed Cervenka. Okwara and Kareem are about to hit Lawrence and end up forcing the throw to be off target. Here they are in the front again with Okwara lined up over the left guard. This time they are rushing this straight up with Kareem working outside of the right tackle. Okwara gets stuck, but Daelin Hayes (9) beats left tackle Mitch Hyatt (75) with a spin move. It’s Okwara who ends up with a sack on the play by hustling to the ball after Lawrence escaped the pocket. The last time Notre Dame ran the Bear front before Okwara was injured was on this play where Okwara beats the left guard inside on another stunt, but Lawrence was able to get the ball out quickly for the conversion. The Irish hadn’t showed this all season, but I would be shocked if we don’t see a lot more of it in 2019. This looked fantastic with Okwara matched up against guards and it forced all of Clemson’s lineman into blocking Notre Dame’s D-line one on one. It was advantage ND in those situations. They generated more pressure from this front alone than Alabama generated their whole game the next week. When they lined up in it with a healthy Okwara, Clemson finished 1 for 4 on 3rd down and the pass rush played a huge role in that. This reminded me a lot of watching former Notre Dame star Justin Tuck lining up inside and rushing the quarterback for the New York Giants. He put up double digit sacks in three of four years and a good number of them came from him lined up as a 3-technique. Okwara tied for the team lead in sacks with 8 in 2018 and I believe that he can improve on that as a senior. I wouldn’t be surprised if lining up in this Bear front more often helps him get there.